Westside Pest Control are your lower mainland experts in Termite control. Our step by step calculated approach to inspections and treatments is second to none. Our guaranteed termite treatment methods are minimally invasive and safe for your family and pets. Determining the type of termite, determines the best treatment method. Westside technicians know their termites! Westside Pest Control technicians use effective termiticides that are tough on termites and safe for your family and pets. Westside Pest Control technicians will show you how to identify signs of termites to help prevent future infestations and save you a ton of money. Nursery areas can also be found in the wood of structures. These areas can be as far down as 3 to 6 m below ground level. Because subterranean termites can get moisture from the soil they can attack any dry wood or other source of cellulose within foraging distance of the colony. Besides wood structures, termites will attack untreated fence posts and attached boards, utility poles, and any other food sources such as cardboard, paper, fiberboard in, on, or close to the ground. 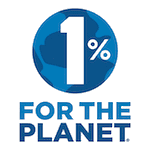 Although less common here than with our southern neighbours, termite infestations are more common than many people living on the west coast of BC and other parts of the province realize. It is helpful to take note of the different castes and different species of this little pest that we need to be aware of here in British Columbia. These winged termites have straight antennas, 4 pairs of wings and can be roughly 25 mm long. These male and female adults are the swarmer termites. When a large amount of termites are spotted outside the colony, what is witnessed is usually a termite swarm. During this nuptial dance, the swarming reproductives find mates. After the fun has been had, the potential queens fly off in hope of starting new colonies. Some queens are capable of producing over 10,000 eggs a day. Sterile, wingless and blind, worker termites make up nearly 90-95% of the colony and are the providers and foragers of the nest. Without worker termites, the termite colony would essentially fail. The worker’s job is to care for the colony members: the termite eggs, termite larvae or nymphs, secondary reproductives, soldiers and the king and queen. These guys feed upon the wood structures of the home – flooring, beams, joists etc. However, these little pests will also feed off anything that contains cellulose. Soldiers are typically bigger than workers — they can be as large as 20mm and have distinctively shaped heads. With the help of their protruding mandibles and pinchers at their front, soldiers will defend the colony from attack. The soldier works hard and will rush to ‘plug’ any broken mud tubes, fill walls or any other areas of the nest that has been disturbed. Interestingly, soldiers don’t actually eat wood and will rely on the workers to feed them because of their large, powerful mandibles (jaws). Their name comes from the damp and at times decaying wood they utilize to locate their colonies. Most common along the pacific coast and larger than subterranean termites, these critters do not typically nest in soil and are most common along the pacific coast – with several species across North America. 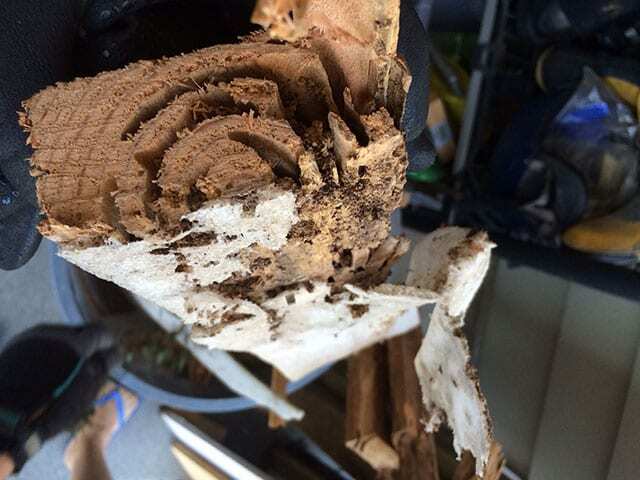 Dampwood termites will produce relatively small colonies in moist wood such as recently cut logs and in the living sections of dead trees – although within ideal conditions, these colonies can become quite large. Swarmers will start a colony of dampwood termites — once they have found a suitable piece of wood, they make a chamber and ensures that the colony is sealed. Once they have covered up entry holes with their own feces, they are ready to begin the mating dance — within about two weeks, the queen will lay about 12 eggs and the colony is officially founded. Dampwood termites can weaken homes and other properties by hollowing out support beams – leading to pricy repairs and a lot of stress. These pests are secretive in nature — in other words, they love to hide — making this particular variety difficult to detect in the early stages. Unlike subterranean termites, these pests do not usually burrow in soil and attack wood directly. 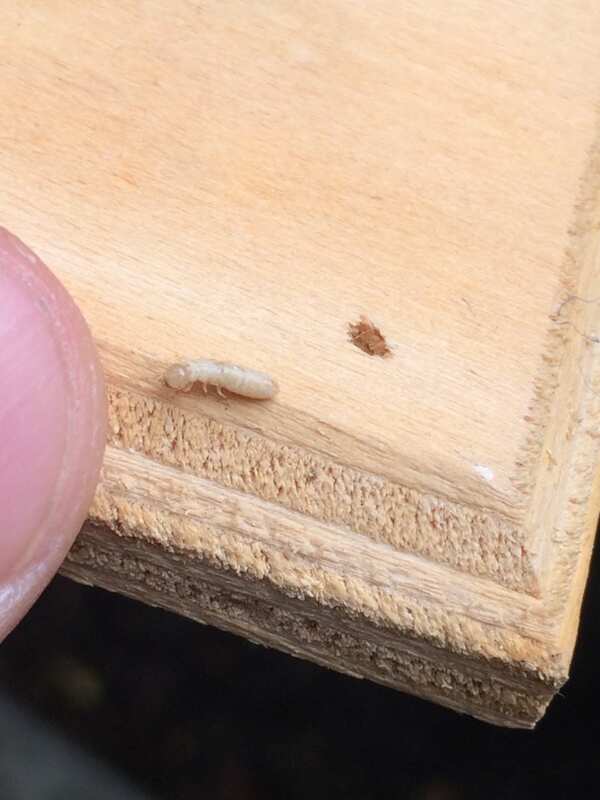 Drywood termites are uncommon in BC and can vary in size, averaging around 3/8 of an inch long. Unlike Subterranean termites, these guys actually nest inside the dry wood they infest. These pests are lower maintenance than dampwood termites and require less moisture — without the need to dig mud tubes or have direct contact with soil. 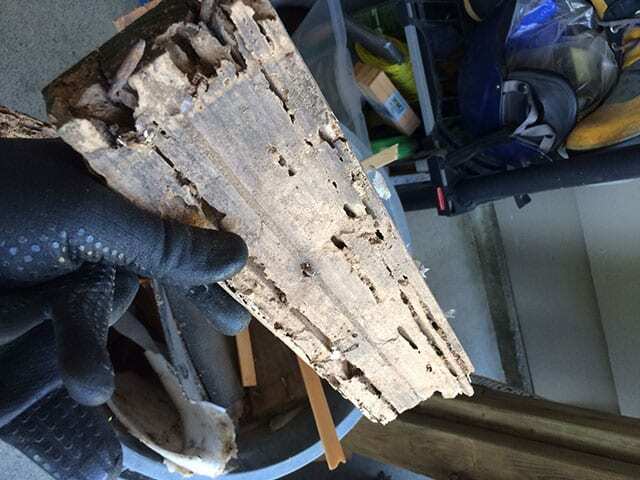 One sign of drywood termite infestation is the creation of ‘kick-out’ holes – they eject their excrement through the wood, leading to their six-sided frass (feces) that is about 1mm in length and resembles a fine grain of sand. 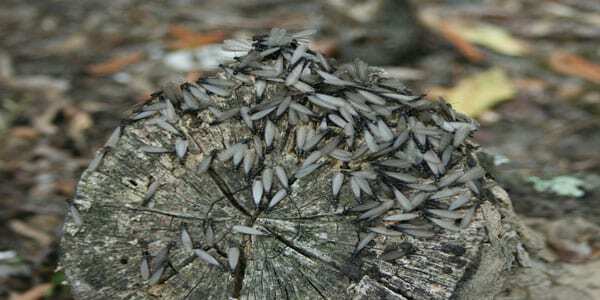 Drywood termites often re-infest the same place when swarming and fly directly into wood. 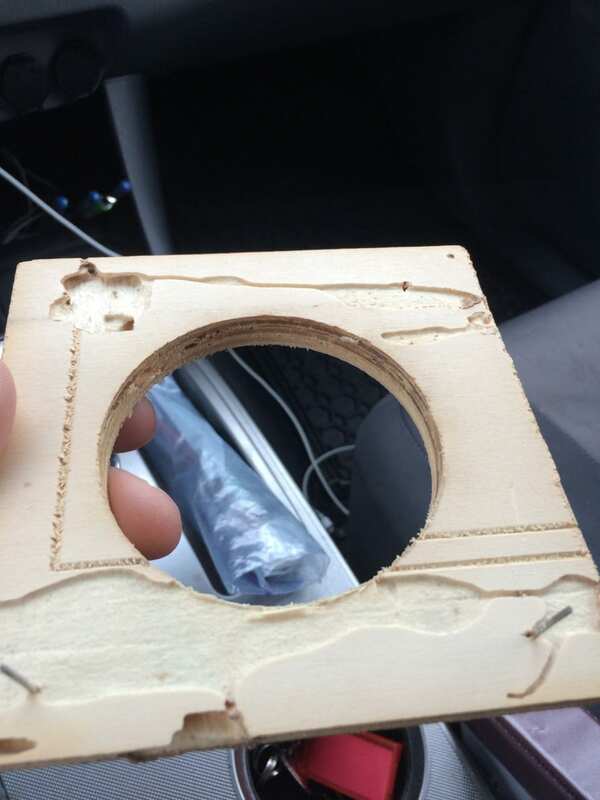 They are likely to target window frames, attics, molding and doors. Although less common on the Westcoast than dampwood termites, subterranean termites can be found frequently on the Sunshine Coast, The North Shore and occasionally in Metro Vancouver. Treatments can be very intensive given the insects nature of keeping below structures. 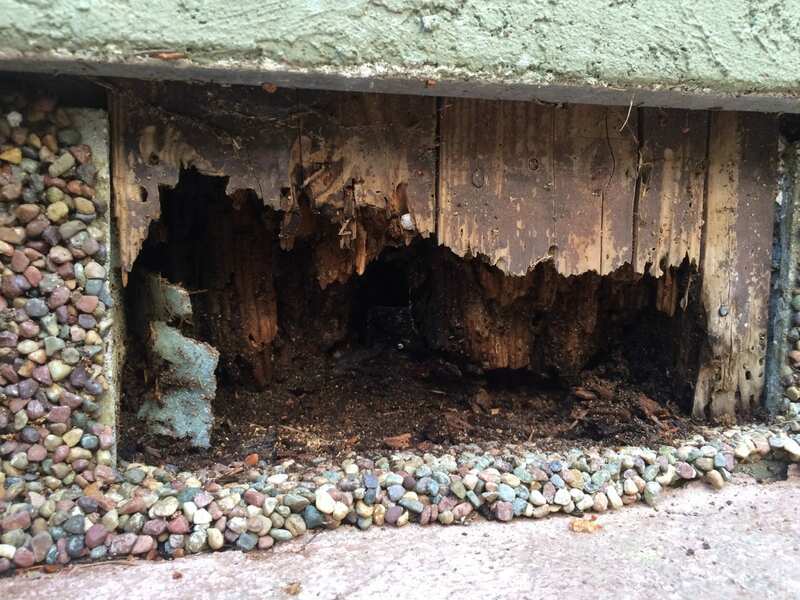 One of the common places to find Subterranean Termites is below old buildings that were constructed without concrete foundations, using only wood frames directly in contact with soil. Drilling and injecting foam in the sub floor is usually required for treatment. In severe infestations, sections of the floor need to also be removed for successful termite extermination. Creamy white to dark brown or black in colour, these critters have antennae, are long and oval in shape and approximately 1/8” long. Subterranean termites commonly live in wet soil where they can avoid temperature extremes and obtain moisture. Subterranean termites build specific tunnels or ‘mud tubes’ to get to food sources and for protection from the open air. They love to feed off of wood with their sharp scissor- like jaws and go at it 24 hours a day, 7 days a week! They also love to feed off anything that has cellulose. You’ll find these guys living in underground colonies and in moist secluded areas above ground where they construct a number of scattered nests. Westside Pest Control provides effective treatments for Termites in condos, townhomes, detached homes and commercial spaces. Our knowledgeable and friendly technicians will walk you through the assessment/treatment process and will answer any questions you may have. Area should be cleared by old wood such as stumps, roots etc. Crawlspace and basement should be kept clear of lumber, firewood etc. Need Help Getting Rid Of Termites? Call Now! Westside Pest Control uncovers significant structural damage caused by damped termites in a West Vancouver home. Termites are not an insect to be left unchecked. Westside Pest Control are Vancouver’s termite experts. Call us today for a free estimate 604-559-9060. How Do I Treat Termites? One popular termite-removal method involves treating the soil around your house with an insecticide. Wood can also be treated directly if termites are inside. Westside Pest Control Technician locates Drywood Termites living aboard a 130 Yacht in a Richmond dry dock. The yacht had been delivered from Florida 6 months earlier. These Termites were still very much alive at the time of inspection. Before you spend 10 million dollars on a yacht and have it shipped north…. make sure it is properly inspected! Drywood termites are very likely to inhabit homes and other structures in BC. Think you may have a termite infestation? Westside Pest Control Has You Covered! Westside Pest Control is your termite and pest control experts. Our experienced, knowledgeable and friendly team will walk you through the assessment/treatment process and answer any questions you may have along the way. We are the termite control specialists you can trust. Call us today 604-559-9060 or email us for a free estimate.